Fantastic image, right person in the right place at the right time for this amazing image. They bound so effortlessly it is a treat to see. Nice capture. There is excitement in nature and you have nailed that feeling here. A perfect well timed shot in superb light! Super moment in super light. What a scene and what a timing ! V.
Perfect timing. Great that you got this! 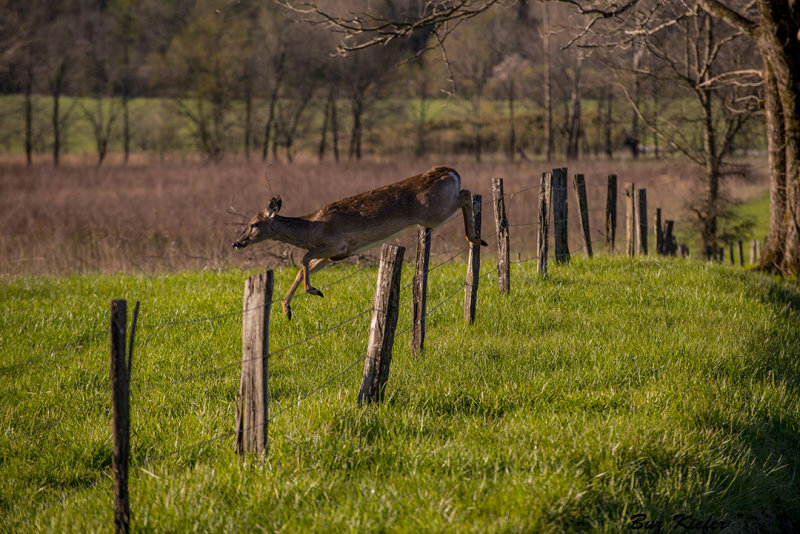 "V"
Great capture of this deer leaping. great timing for this lovely scene.V. Ah to be able to leap over a wire fence with impunity.good timing, Buz. "V"
Off to greener pastures, although it looks green both sides. Maybe it just likes the challenge, plus to opportunity to give you a great photo! Such perfect timing to get this great leap! V.
positively jubilant, and well prepared to tackle an obstacle...sharp shooting here..
Superbly caught action capture Buz. V.